[Sam Fok], an engineering student at the Washington University School of Engineering wrote in to share a project he and his classmates [Raphael Schwartz, Mark Wronkiewicz, Charles Holmes, Jessica Zhang, Nathan Brodell, and Thane Somers] have been working on as their entry in the 2011 RESNA Student Design Competition. 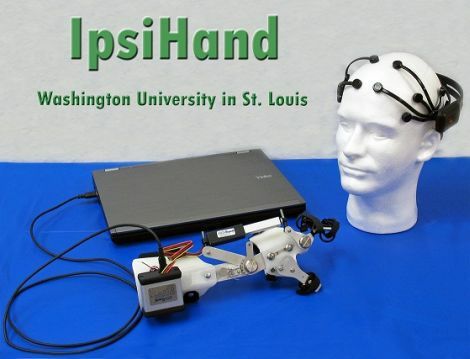 Their project, IpsiHand, is designed to help rehabilitate those who have suffered a stroke or other Traumatic Brain Injury (TBI). Most motor functions in the body are controlled by the opposite hemisphere of the brain, a process called contralateral motor control. When a patient suffers from TBI, they often lose control over some portion of the body opposite the injury. Recent studies have shown however, that while most motor control is contralateral, hand movements also create ipsilateral brain activity. This means that the uninjured side of the brain can effectively control both hands, with a bit of mechanical assistance. Their process uses an Emotiv Epoch EEG headset, which we have discussed before, to monitor the patients’ brain for activity. The data is sent wirelessly to a computer which processes the data, singling out ipsilateral brain waves. The computer then actuates a modified hand orthosis to control grasping in real time. We think their work is fantastic, and the team’s creation has a wide array of applications in the field of therapy and assisted living. We wish them luck in their competition, and hope to see this technology put to good use in the future. This looks like it could really help people. Hope they get it produced. My grandmother suffered a stroke last year and lost control of her left arm. I’d love to get my hands on this for her. I’ve got money to burn too!